Marine Corps Base Camp Pendleton, California is one of the top expeditionary training bases for the United States Marine Corps. It’s located near Oceanside in North San Diego County, and the installation is said to be approximately the size of Rhode Island! Camp Pendleton employs nearly four thousand civilians and there are more than 30 thousand active duty military members assigned. There is a high cost of living typical of most Southern California locations, but the local area is beautiful and there are many outdoors attractions to explore at and near the Pacific Ocean. 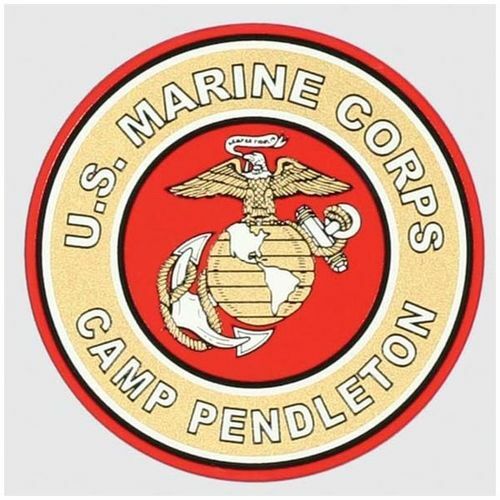 Find information about Camp Pendleton, California including the main commercial and DSN numbers for the base, information on basic services, base transportation, lodging for TDY and PSCing personnel, and inprocessing. Similar to many other military bases on American soil, Camp Pendleton was born out of a need for expanded facilities due to American involvement in World War Two; in the 1940s the Marine Corps needed a large training facility and in 1942 the United States Marines purchased land in California known as Rancho Santa Margarita y Las Flores. Just prior to this, President Franklin D. Roosevelt had declared a national emergency in 1941 and this led to the determination that the new Marine Corps facility should be the source of amphibious warfare training for a much larger force than was required pre-WW2. The 9th Marine Regiment were among the first to train at the new Marine Corps base, which was christened Camp Pendleton by Roosevelt in honor of a World War One general who had been a vocal advocate of a West Coast training base; Major General Joseph Pendleton is still honored today as the spiritual founder of the base. Circa 1943, the first female Marine Corps reservists were working at the base; this accomplishments is among Camp Pendleton’s firsts. Long after the end of World War Two, some two hundred thousand Marines would be trained at Camp Pendleton before shipping out to Korea and later Vietnam. In the 1980s, amphibious warfare training became supplemented at the base by training in expeditionary tactics that combined infantry, aircraft, supply operations, and armored operations. The expeditionary approach has been used all over the world since in places like Bosnia, Panama, the Persian Gulf, Somalia, and Afghanistan. From humble beginnings, Camp Pendleton has evolved into a major part of Marine Corps operations and features more than 2500 buildings and over 500 miles of road. 38,000 military family members live in base housing and the official site for the base says Pendleton’s “daytime population” totals 70,000 military and civilian personnel or more. Oceanside is closest to the base, and features many outdoor attractions such as Harbor Beach, Oceanside Pier, and plenty of places to try windsurfing and other aquatic sports. There are wine tours and border tours, plus visitors can take city tours, visit LegoLand California, or check out the California Surf Museum. San Diego is 38 miles away and has plenty of major league sports including the San Diego Padres and PGA golf tours. There are a wide variety of ocean and beachfront attractions, plus the San Diego Zoo, and the USS Midway Museum. Most non-student personnel are required to report to the Installation Personnel Admin Center (IPAC) Inbound, Bldg 13107. Temporary lodging is arranged at check-in. Students will check in directly to the school they are attending; reporting procedures will be given to students before arrival. For Navy members who are assigned to the Naval Hospital, reporting and check-in procedures require visiting the Officer of the Day at the Quarter Deck, Bldg. H-200 24-7. All other Navy members are required to check in with the appropriate command. All check-ins are required to be in Class A uniforms. Child care at Camp Pendleton is handled by base Child Development Centers (CDCs) offering accredited full time, part time, after school care, and more for children six weeks through 12 years of age. The CDCs are open to the children of qualifying active duty military, DoD civilian workers, Reservists on active duty and during inactive training, plus DoD contractors. There is a long waiting list for on-base child care, as long as 12 months depending on circumstances and demand. Family Childcare options, where on-base providers offer day care services from private homes that are property accredited, are also available. Inclusion Action Team (IAT) meeting, if child has special needs to include allergies. Those PCSing to Camp Pendleton are directed to track and monitor their household goods shipments via the Defense Personal Property System at Move.mil. The Camp Pendleton official site urges PCSing military to insure the total weight of their household good shipment does not exceed the amount authorized in the member’s PCS orders. For more information contact the Personal Property Household Goods section at (760) 725-8663/8666. All parents are advised that school bus services may not be available for local schools. It is strongly encouraged to hand-carry all student records including immunizations, grades, and birth certificates. All students are required to have immunizations-those requirements can be found at the San Diego Health and Human Services official site. Approximately two-thirds of the military personnel assigned to Camp Pendleton live off-base in the local community. The Family Housing Office encourages those who wish to live at Camp Pendleton instead of finding off-base housing to apply in advance by submitting a DD1746 Housing Application Form which may be submitted to the Housing Office via fax at 760-725-5559 or DSN 312-365-5559. Service member eligibility for a housing assignment begins with the date of departure from the losing base. On-base waiting lists can run as long as 16 months and this wait may depend on rank, size of the housing required, etc. Temporary lodging facilities at Camp Pendleton include the South Mesa Lodge, Ward Lodging, and the Pacific Views Lodge. Military personnel or civilian Government employees with official orders traveling on temporary assignment may reserve TLF quarters. Active Duty military members traveling on PCS orders are also eligible and have first priority. Make reservations at the South Mesa Lodge at 760-763-7805. Ward Lodging reservations can be made six months ahead of time by calling 760-725-5194. Pacific Views Lodge reservations can also be made six months in advance by calling (760) 763-7805. There are multiple options for getting to Camp Pendleton from the two major area airports. The United Service Organization (USO) offers referrals for area shuttle bus services to Camp Pendleton. Call 619-296-3192 for more information. There are also taxis, car rental, and ride-sharing services (depending on availability, local laws, and other considerations). The Camp Pendleton official site mentions the USO for new arrivals but does not specify whether shuttle service or referrals are available. Taxi service, vehicle rental, and ride-sharing services may be the best options for some new arrivals depending on timing, availability, and other factors. Driving on Camp Pendleton requires registration in a system known as DBIDS, which stands for Defense Biometric Identification System. This is considered a “physical access control system”. All new arrivals PCSing to Camp Pendleton will be enrolled in DBIDS “after their first ID scan upon entering Camp Pendleton” according to the official site. Camp Pendleton visitors are required to get DBIDS passes at the Camp Pendleton Visitor Center. Contractors & vendors will apply for their DBIDS credentials at Base Access Control. All drivers and their vehicles operating on the installation must comply with State of California rules including insurance minimums, etc. All drivers are required to carry current liability insurance, current registration and “proof of a valid Real ID Act compliant [or state approved extension] driver’s license”. All other forms of Camp Pendleton access for vehicles such as RAPIDGate are no longer valid after Sept. 30, 2018.